Even the heartiest Alaskan employs a coping mechanism or two to help weather the state's extreme seasons: vitamin D supplements? Blackout curtains in summer? Sunlamps in winter? 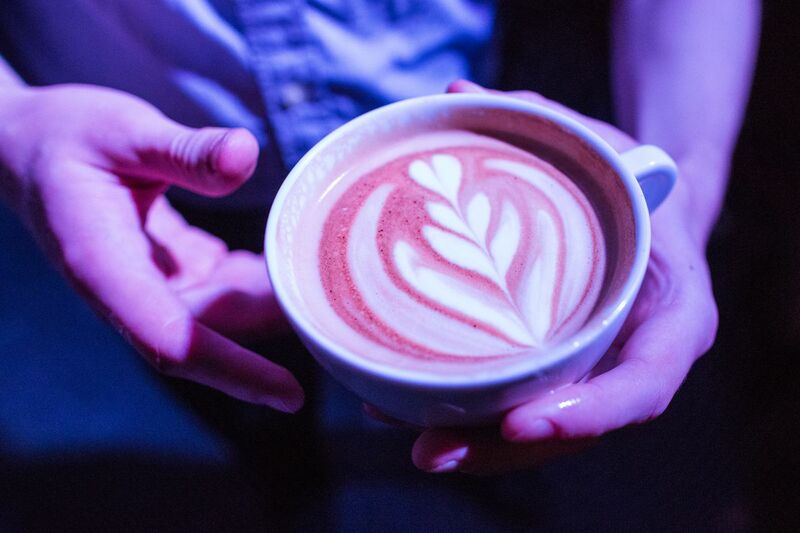 We all have our own techniques but there is one that most of us can agree upon: coffee therapy. Year-round. A hot, frothy cappuccino, sipped in a cozy cafe, can be the perfect cure for the low-winter-sun blues. Or, skip the trudge through a snowy parking lot and pick up a hot brew from one of Anchorage's many drive-through coffee carts. Sip smugly in your warm car. Caffeinated pick-me-ups are no less valuable in summer when most Alaskans are burning the candle at both ends. After all, if the sun never goes down, is it ever really bedtime? Which is why Alaska's coffee roasters are household names to the locals. There's Kaladi Brothers (my teens call it "K Bros"), which grew from a lone espresso cart in 1984 to a burgeoning business with 14 stores around the state (and one in Seattle). There is SteamDot Coffee Co., whose south side cafe features Anchorage's only "slow bar," where your coffee is ground and brewed fresh to order. And then there's Black Cup Coffee (formerly Cafe del Mundo, a high-end coffee institution in Anchorage since 1975). Black Cup serves a full menu of espresso drinks but their motto, as their name implies, is: "extraordinary coffee best served black." It's a friendly battle of the beans. Everyone has their favorite, but each of these coffee purveyors enjoys a well-earned popularity. Personally, I'm partial to Kaladi Brothers, if only because their main roasting facility is on my daily commute. The neighborhood wafts with the toasty, nutty smell of roasting beans and it's a heavenly, invigorating aroma. But coffee, for me at least, is as much about cafe culture as it is about beans. A good coffee house is part community center, part extended office, part mental day spa and part art gallery. It's a great way to learn about someplace new. And in downtown Anchorage, cafe culture is thriving. Kaladi Brothers Cafe, which shares space with the Alaska Center for the Performing Arts in the heart of downtown, is a bustling space and a convenient spot to grab a cup of stamina while in the midst of souvenir shopping or if you're on the way to see a show. Across the street is the newly built Williwaw venue, which plays host to SteamDot Coffee and offers an expansive and relatively serene seating area perfect for reading, catching up on emails or writing out postcards. Another local favorite is Dark Horse Coffee, a cozy, slightly out-of-the-way spot with a reputation for great coffee drinks (which they source from Heritage Coffee in Juneau) and avocado toast. Bonus points for their inviting little porch, where you can sit and sip on sunny days. If you require a hearty meal alongside your Americano, Kaladi Brothers coffee is served up at the friendly Snow City Cafe. A favorite with locals, this funky, vibrant spot features rotating local art, an impressive variety of eggs Benedict and expertly crafted espresso drinks. I'm particularly partial to their use of tall, sleeved pint glasses to serve large-sized lattes and mochas. Hot drinks taste better served this way. I don't know why. For a coffee house experience with an edgy, more urban vibe, check out the Red Chair Cafe, with its industrial chic aesthetic and bold graffiti artwork. While the atmosphere is contemporary, its menu is reassuringly comforting. It might be the only place in town to feature authentic scrapple. On the other end of the ambiance spectrum is Kobuk Coffee. On Town Square, in the historic Kimball Building (1915), this charming little gift shop retains some of its original fixtures and flooring. Packed full of unnecessary necessities (old-timey candy, scented candles and teacups) you'll be hard-pressed to make it to the coffee room without doing some impromptu browsing (and, if you're like me, buying). Kobuk offers a whole range of espresso drinks and a wide variety of teas but, whichever you choose, make sure you get house-made doughnuts to keep it company. What kind of doughnuts, you ask? Like everything else in the store: old-fashioned. Side Street Espresso is everything I love about coffeehouse culture all under one tiny roof. Husband-and-wife owners George Gee and Deborah Seaton have been running it for 25 years and it has evolved from a cafe into a neighborhood institution. 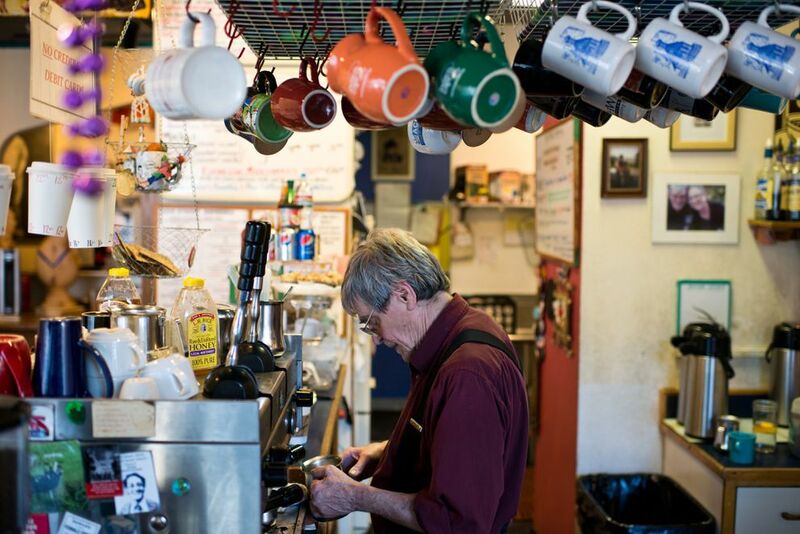 In contrast to the gleaming fixtures of trendier, newer cafes in town, Side Street Espresso is like a living scrapbook commemorating two and a half decades of the Anchorage community. The cozy space is filled with curios, a Buddhist shrine, a lending library, a rack of local postcards, board games and layers of notices about local events. 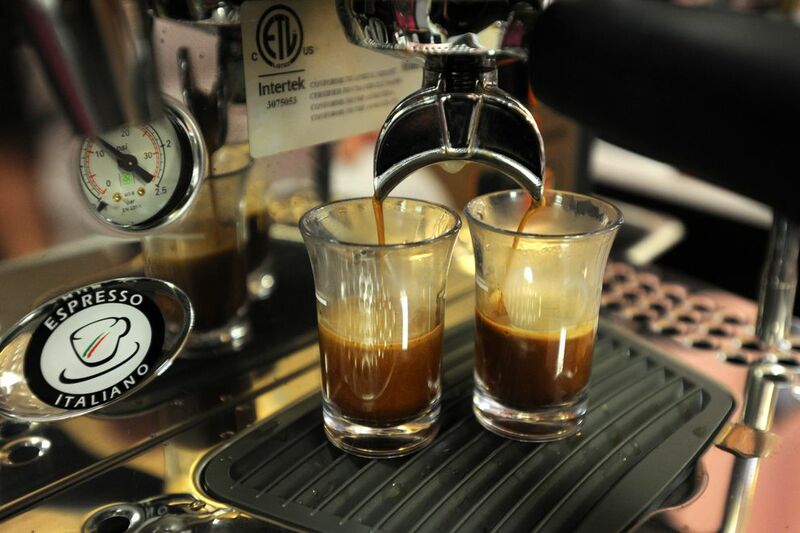 Espresso drinks are expertly made, and George treats everyone like an old friend. But my favorite thing about Side Street Espresso is the art. George has been creating an original piece of art on a white "specials" board almost every day for 20 years. Inspired by his morning thoughts on his walk to work, Monday's board might announce a Toasted Marshmallow Mocha atop a portrait of Maria Callas. Or Atticus Finch might share space with the price-point for a cherry-flavored latte. George used to erase these daily (with a Zen-like attitude that I cannot fathom) but local public outcry inspired him to begin to preserve them. They've now been assembled into a book of collected works called "Flutters from Side Street." It's a reminder that a cup of coffee can invigorate, but a cafe can inspire.